Explanation: Comet Holmes continues to be an impressive sight to the unaided eye. The comet has diminished in brightness only slightly, and now clearly appears to have a larger angular extent than stars and planets. 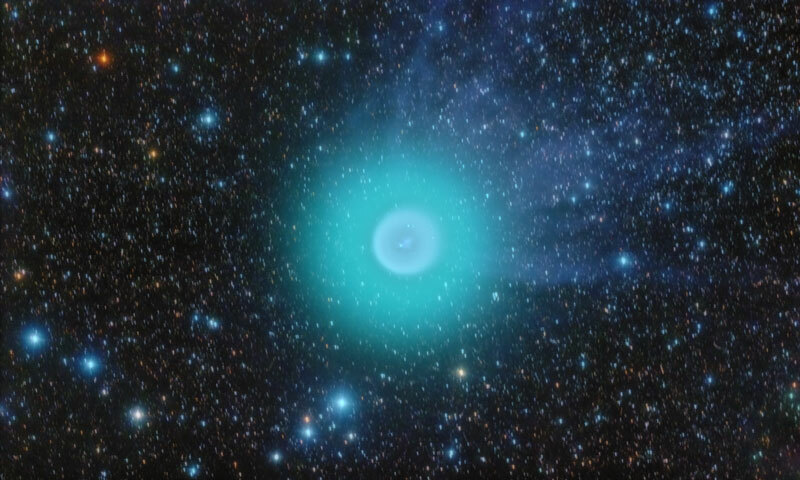 Astrophotographers have also noted a distinctly green appearance to the comet's coma over the past week. Pictured above over Spain in three digitally combined exposures, Comet 17P/Holmes now clearly sports a tail. The blue ion tail is created by the solar wind impacting ions in the coma of Comet Holmes and pushing them away from the Sun. Comet Holmes underwent an unexpected and dramatic increase in brightness starting only two weeks ago. The detail visible in Comet Holmes' tail indicates that the explosion of dust and gas that created this dramatic brightness increase is in an ongoing and complex event. Comet Holmes will move only slightly on the sky over during the next month.